In a previous post, I looked at the Oculus Rift’s internal projection in detail, and did some analysis of how stereo rendering setup is explained in the Rift SDK’s documentation. Looking at that again, I noticed something strange. which, to those in the know, doesn’t look like a regular OpenGL projection matrix, such as created by glFrustum(…). More precisely, the third row of P is off. The third-column entry should be instead of , and the fourth-column entry should be instead of . To clarify, I didn’t make a mistake in the derivation; the matrix’s third row is the same in the SDK documentation. What’s the difference? It’s subtle. Changing the third row of the projection matrix doesn’t change where pixels end up on the screen (that’s the good news). It only changes the z, or depth, value assigned to those pixels. In a standard OpenGL frustum matrix, 3D points on the near plane get a depth value of 1.0, and those on the far plane get a depth value of -1.0. The 3D clipping operation that’s applied to any triangle after projection uses those depth values to cut off geometry outside the view frustum, and the viewport projection after that will map the [-1.0, 1.0] depth range to [0, 1] for z-buffer hidden surface removal. Using a projection matrix as presented in the previous post, or in the SDK documentation, will still assign a depth value of -1.0 to points on the far plane, but a depth value of 0.0 to points on the (nominal) near plane. Meaning that the near plane distance given as parameter to the matrix is not the actual near plane distance used by clipping and z buffering, which might lead to some geometry appearing in the view that shouldn’t, and a loss of resolution in the z buffer because only half the value range is used. I’m assuming that this is just a typo in the Oculus SDK documentation, and that the library code does the right thing (I haven’t looked). I have to make a confession: I’ve been playing with the Oculus Rift HMD for almost a year now, and have been supporting it in Vrui for a long time as well, but I haven’t really spent much time using it in earnest. I’m keenly aware of the importance of calibrating head-mounted displays, of course, and noticed right away that the scale of virtual objects seen through the Rift was way off for me, but I never got around to doing anything about it. Until now, that is. I’m on vacation in Mexico right now, and yesterday evening my brother-in-law took my wife and me to see “The Hobbit,” in 3D, in quite the fancy movie theater, with reclining seats and footrests and to-the-seat service and such. I don’t want to talk about the movie per se, short of mentioning that I liked it, a lot, but about the 3D. Or the “stereo,” I should say, as I mentioned previously. My overall impression was that it was done very well. Obviously, the movie was shot in stereo (otherwise I’d have refused to see it that way), and obviously a lot of planning went into that aspect of it. There was also no apparent eye fatigue, or any other typical side effect of bad stereo, and considering how damn long the movie was, and that I was consciously looking for conversion problems or artifacts, that means someone was doing something right. As a technical note to cinemas: there was a dirty spot on the screen, a bit off to the side (looked as if someone had thrown a soda at the screen a while ago), and that either degraded the screen polarization, or was otherwise slightly visible in the image, and was a bit distracting. So, keep your stereo screens immaculately clean! Another very slightly annoying thing was due to the subtitles (the entire movie was shown in English with Spanish subtitles, and then there were the added subtitles when characters spoke Elvish or the Dark Tongue), and even though I didn’t read the subtitles, I still automatically looked at them whenever they popped up, and that was distracting because they were sticking out from the screen quite a bit. I received an email about a week ago that reminded me that, even though stereoscopic movies and 3D graphics have been around for at least six decades, there are still some wide-spread misconceptions out there. Those need to be addressed urgently, especially given stereo’s hard push into the mainstream over the last few years. While, this time around, the approaches to stereo are generally better than the last time “3D” hit the local multiplex (just compare Avatar and Friday the 13th 3D), and the wide availability of commodity stereoscopic display hardware is a major boon to people like me, we are already beginning to see a backlash. And if there’s a way to do things better, to avoid that backlash, then I think it’s important to do it. So here’s the gist of this particular issue: there are primarily two ways of setting up a movie camera, or a virtual movie camera in 3D computer graphics, to capture stereoscopic images — one is used by the majority of existing 3D graphics software, and seemingly also by the “3D” movie industry, and the other one is correct. So, how do you set up a stereo camera? The basic truth is that stereoscopy works by capturing two slightly different views of the same 3D scene, and presenting these views separately to the viewers’ left and right eyes. The devil, as always, lies in the details. Say you have two regular video cameras, and want to film a “3D” movie (OK, I’m going to stop putting “3D” in quotes now. My pedantic point is that 3D movies are not actually 3D, they’re stereoscopic. Carry on). What do you do? If you put them next to each other, with their viewing directions exactly parallel, you’ll see that it doesn’t quite give the desired effect. When viewing the resulting footage, you’ll notice that everything in the scene, up to infinity, appears to float in front of your viewing screen. This is because the two cameras, being parallel, are stereo-focused on the infinity plane. What you want, instead, is that near objects float in front of the screen, and that far objects float behind the screen. Let’s call the virtual plane separating “in-front” and “behind” objects the stereo-focus plane. The fundamental problem with toe-in stereo is that it makes sense intuitively — after all, don’t our eyes rotate inwards when we focus on nearby objects? — but that our intuition does not correspond to how 3D movies are shown. 3D (or any other kind of) movies are not projected directly onto our retinas, they are projected onto screens, and those screens are in turn viewed by us, i.e., they project onto our retinas. Now, when a normal camera records a movie, the assumption is that the movie will later be projected onto a screen that is orthogonal to the projector’s projection direction, which is implicitly the same as the camera’s viewing direction (the undesirable effect of non-orthogonal projection is called keystoning). In a toe-in stereo camera, on the other hand, there are two viewing directions, at a slight angle towards each other. But, in the theater, the cameras’ views are projected onto the same screen, meaning that at least one, but typically both, of the component images will exhibit keystoning (see Figures 1 and 2). Figure 1: The implied viewing directions and screen orientations caused by a toe-in stereo camera based on two on-axis projection cameras. The discrepancy between the screen orientations implied by the cameras’ models and the real screen causes keystone distortion, which leads to 3D convergence issues and eye strain. Figure 2: The left stereo image shows the keystoning effect caused by toe-in stereo. A viewer will not be able to merge these two views into a single 3D object. The right stereo image shows the correct result of using skewed-frustum stereo. 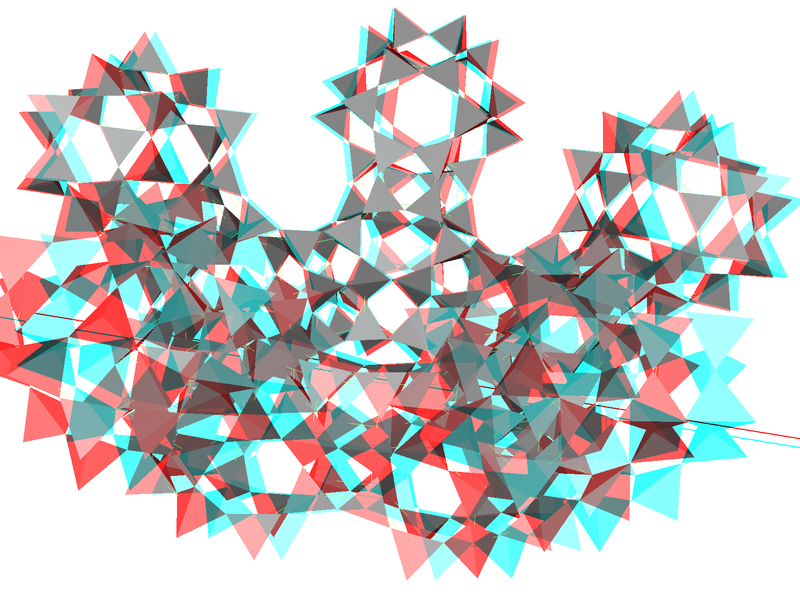 You can try for yourself using a pair of red/blue anaglyphic glasses. The bad news is that keystoning from toe-in stereo leads to problems in 3D vision. Because the left/right views of captured objects or scenes do not actually look like they would if viewed directly with the naked eye, our brains refuse to merge those views and perceive the 3D objects therein, causing a breakdown of the 3D illusion. When keystoning is less severe, our brains are flexible enough to adapt, but our eyes will dart around trying to make sense of the mismatching images, which leads to eye strain and potentially headaches. Because keystoning is more severe towards the left and right edges of the image, toe-in stereo generally works well enough for convergence around the center of the images, and generally breaks down towards the edges. And this is why I think a good portion of current 3D movies are based on toe-in stereo (I haven’t watched enough 3D movies to tell for sure, and the ones I’ve seen were too murky to really tell): I have spoken with 3D movie experts (an IMAX 3D film crew, to be precise), and they told me the two basic rules of thumb for good stereo in movies: artificially reduce the amount of eye separation, and keep the action, and therefore the viewer’s eyes, in the center of the screen. Taken together, these two rules exactly address the issues caused by toe-in stereo, but of course they’re only treating the symptom, not the cause. As an aside: when we showed this camera crew how we are doing stereo in the CAVE, they immediately accused us of breaking the two rules. What they forgot is that stereo in the CAVE obviously works, including for them, and does not cause eye strain, meaning that those rules are only workarounds for a problem that doesn’t exist in the first place if stereo is done properly. 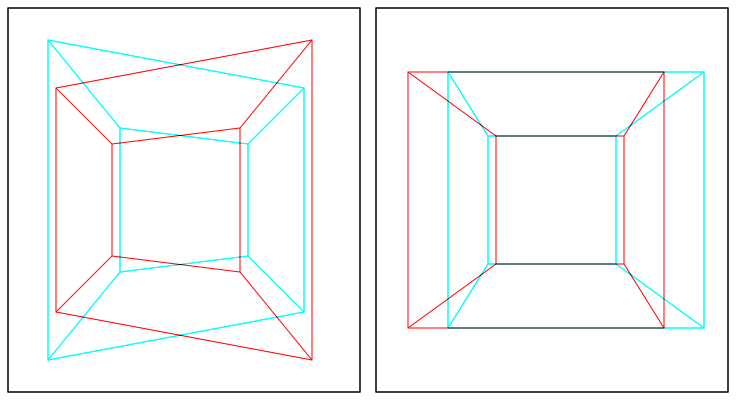 In a nutshell, skewed-frustum stereo works exactly as ordered. Even stereo pairs with very large disparity can be viewed without convergence problems or eye strain, and there are no problems when looking towards the edge of the image. Good (skewed-frustum) stereo vs bad (toe-in) stereo. I generated these using the Nanotech Construction Kit and Vrui; as it turns out, Vrui is flexible enough to support bad stereo, but at least it was considerably harder setting it up than good stereo. So that’s a win, I guess. There are only two issues to be aware of: for one, objects at infinity will have the exact separation of the viewer’s eyes, so if the programmed-in eye separation is larger than the viewer’s actual eye separation, convergence for very far away objects will fail (in reality, objects can’t be farther away than infinity, or at least our brains seem to think so). Fortunately, the distribution of eye separations in the general population is quite narrow; just stick close to the smaller end. But it’s a thing to keep in mind when producing stereoscopic images for a small screen, and then showing them on a large screen: eye separation scales with screen size when baked into a video. This is why, ideally, stereoscopic 3D graphics should be generated specifically for the size of the screen on which they will be shown, and for the expected position of the audience. The other issue is that virtual objects very close to the viewer will appear blurry. This is because when the brain perceives an object to be at a certain distance, it will tell the eyes to focus their lenses to that distance (a process called accommodation). But in stereoscopic imaging, the light reaching the viewer’s eyes from close-by virtual objects will still come from the actual screen, which is much farther away, and so the eyes will focus on the wrong plane, and the entire image will appear blurry. Unfortunately, there’s nothing we can do about that right now, but at least it’s a rather subtle effect. In our CAVE, users standing in the center can see virtual objects floating only a few inches in front of their eyes quite clearly, even though the walls, i.e., the actual screens, are four feet away. This focus miscue does have a noticeable after-effect: after having used the CAVE for an extended period of time, say a few hours, the real world will look somewhat “off,” in a way that’s hard to describe, for a few minutes after stepping out. But this appears to be only a temporary effect. Taking it back to the real 3D movie world: the physical analogy to skewed-frustum stereo is lens shift. Instead of rotating the two cameras inwards, one has to shift their lenses inwards. The amount of shift is, again, determined by the distance to the desired stereo-focus plane. Technically, creating lens-shift stereo cameras should be feasible (after all, lens shift photography is all the rage these days), so everybody should be using them. And some 3D movie makers might very well already do that — I’m not a part of that crowd, but from what I hear, at least some don’t. In the 3D graphics world, where cameras are entirely virtual, it should be even easier to do stereo right. However, many graphics applications use the standard camera model (focus point, viewing direction, up vector, field-of-view), and can only represent non-skewed frusta. The fact that this camera model, as commonly implemented, does not support proper stereo, is just another reason why it shouldn’t be used. So here’s the bottom line: Toe-in stereo is only a rough approximation of correct stereo, and it should not be used. If you find yourself wondering how to specify the toe-in angle in your favorite graphics software, hold it right there, you’re doing it wrong. The fact that toe-in stereo is still used — and seemingly widely used — could explain the eye strain and discomfort large numbers of people report with 3D movies and stereoscopic 3D graphics. 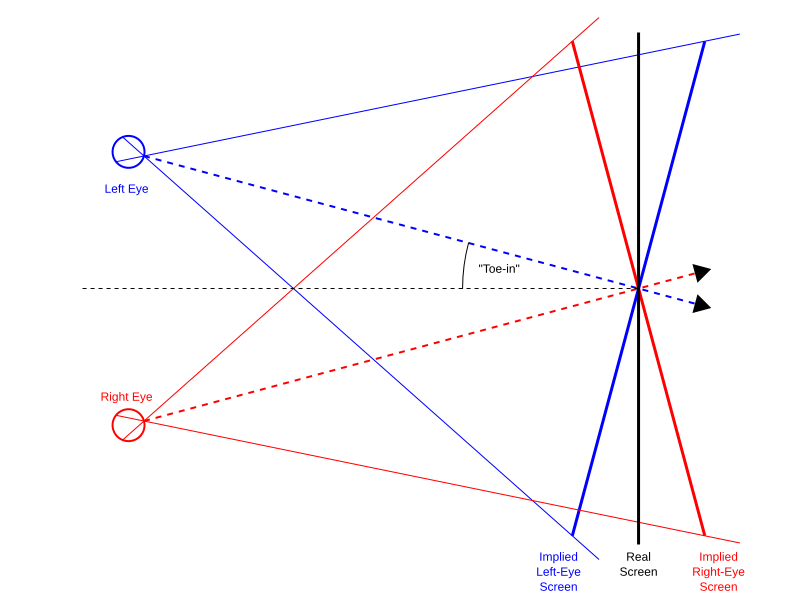 Real 3D movie cameras should use lens shift, and virtual stereoscopic cameras should use skewed frusta, aka off-axis projection. While the standard 3D graphics camera model can be generalized to support skewed frusta, why not just replace it with a model that can do it without additional thought, and is more flexible and more generally applicable to boot? Update: With the Oculus Rift in developers’ hands now, I’m getting a lot of questions about whether this article applies to head-mounted displays in general, and the Rift specifically. Short answer: it does. There isn’t any fundamental difference between large screens far away from the viewer, and small screens right in front of the viewer’s eyes. The latter add a wrinkle because they necessarily need to involve lenses and their concomitant distortions so that viewers are able to focus on the screens, but the principle remains the same. One important difference is that small screens close to the viewer’s eyes are more sensitive to miscalibration, so doing stereo right is, if anything, even more important than on large-screen displays. And yes, the official Oculus Rift software does use off-axis projection, even though the SDK documentation flat-out denies it.